Spring has sprung with a vengeance! As I write this, sitting on post in my (barely air-conditioned) ambulance, the temperature is in the mid-80’s, with clear blue skies and bright sun. This can only mean one thing. Each year, at the beginning of the season, I try to do a little organization/maintenance on my gear. 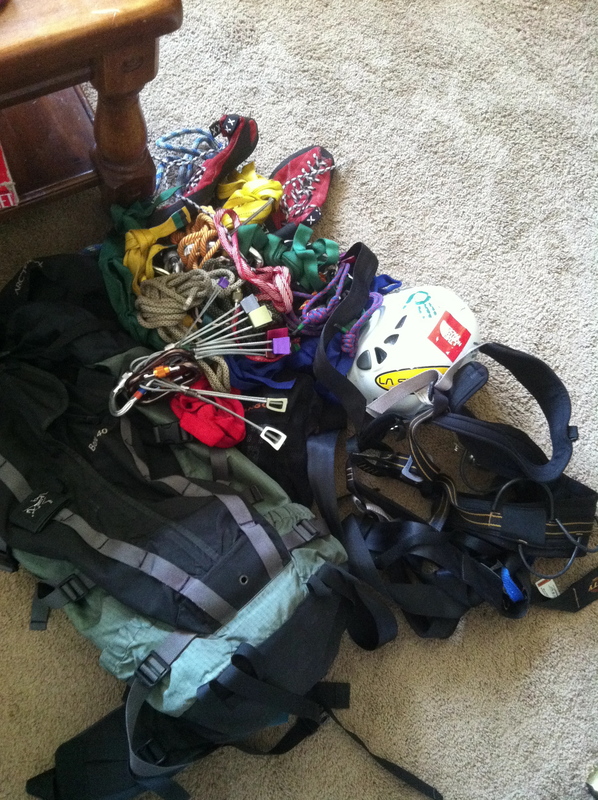 So, last week, I pulled my climbing pack from hibernation. 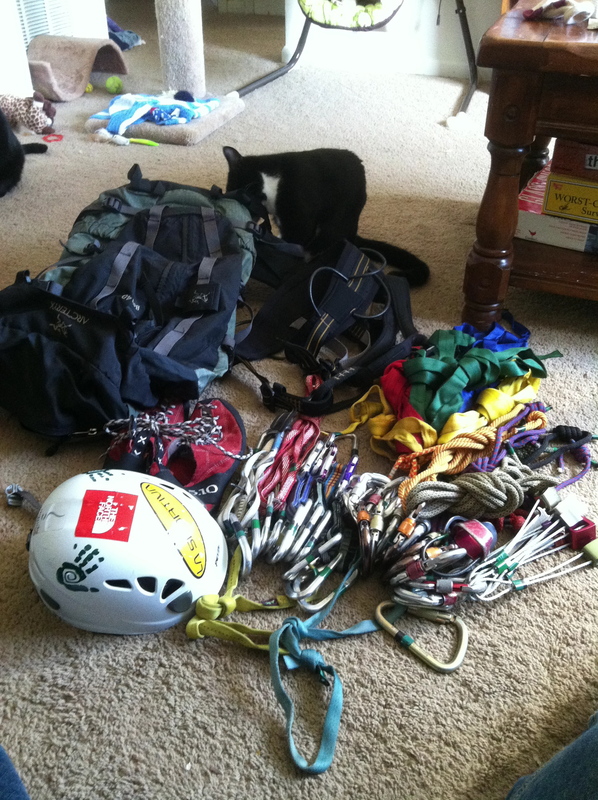 I dumped all my climbing gear out onto the living room floor, forming an untidy, but colorful jumble. The cats were immediately interested and curious. Milo, the new kitten (dumb as a rock, incidentally) had never seen the process. He immediately began picking through the gear, sniffing everything. Oliver, who had seen this foolishness before, sat nearby. Though he pretended that he wasn’t interested, he kept a close eye on the proceedings. My helmet got a wipe down to remove some of the grime and scuffs from the winter. I haven’t been able to wear my helmet as much in the past year as I’d like, so it had spent a lot of time in my backpack. In fact, I think the last time I climbed while wearing it was last spring. My dad and I spent a day at Seneca, and climbed Conn’s West, a (very exposed) 5.4-5.5. As I cleaned it, I noticed the North Face sticker on the top, and I couldn’t help but think about TNF’s slogan: “Never Stop Exploring.” It’s seriously my favorite marketing phrase, from any company, anywhere. While I try not to be a hyper-consumeristic individual, I have no problem admitting that TNF’s marketing campaign resonates with me. In fact, I’d probably make it my blog’s slogan, but it’s a trademark and I’d probably get in trouble. Gear in need of re-taping. 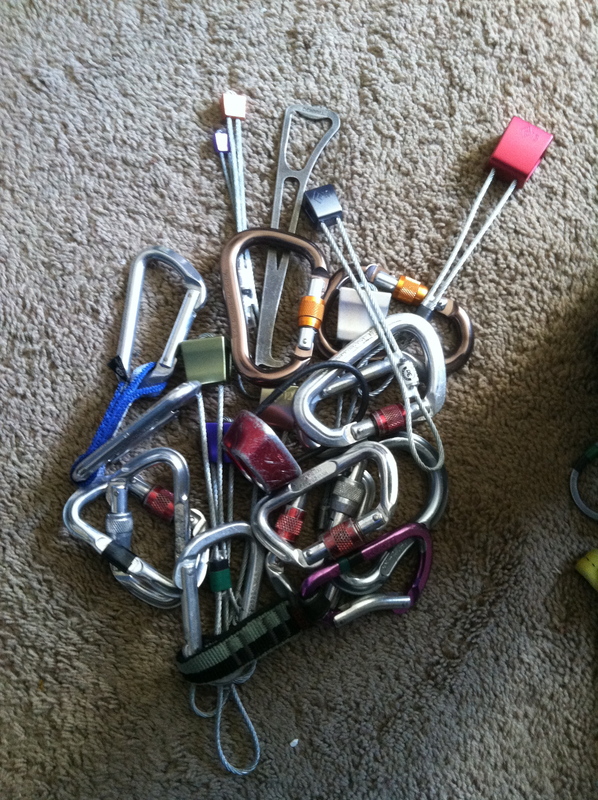 I also spent some time inspecting each piece of hardware, making sure that the gates and locks on the carabiners were functional, and making sure that my ATC isn’t developing sharp edges. I’ve had this ATC since I was 13, and it actually holds some sentimental value for me (someday I’ll share that story). I also replaced tattered marking tape on the pieces that needed it, and put new tape on some recent acquisitions (mostly Black Diamond stoppers and a few pear-shaped ‘bieners). I spent a good amount of time checking my runners and webbing. 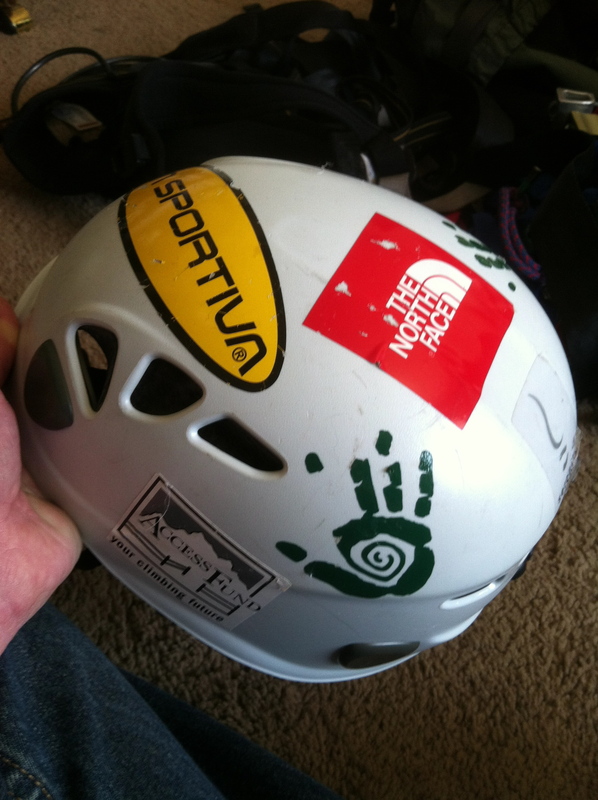 Two years ago, a climber fell to his death after a mis-tied knot in his anchor webbing failed. I want to make sure this doesn’t happen to me! So, I spent a few minutes with each runner, making sure there were no rips/damage to the material, and making sure the knot was sound and fully complete. I re-racked and organized everything so it was easy to use. No more jumbled mess! Oh, that’s much better! Milo and Oliver had to make themselves part of the process. I have some time on my hands today. Basically, I’m doing odd jobs, and if they don’t have any odd jobs for me, I wait. While I’ve been waiting, I’ve been trip planning. My high school sent us on trips every other year, called Mini-Term. Basically, it was a week in a small-group environment, led by a teacher, doing something educational outside of school. Some groups put their study of French and Spanish to use, others focused on the history of tidewater Virginia, some groups dug deeper into choral music, and other groups focused on short-term mission trips. 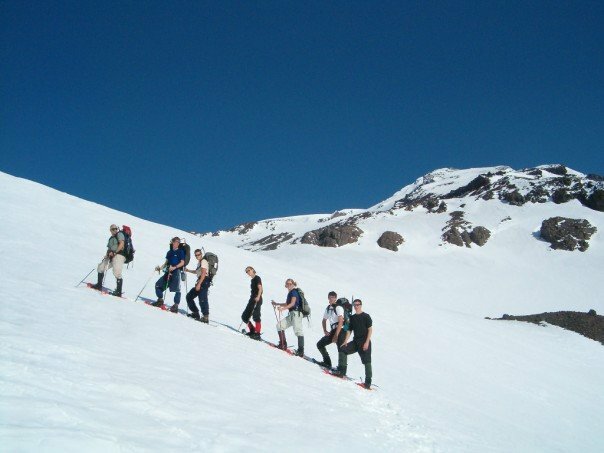 When I was in 11th grade, I signed up for the mini-term which flew to Oregon, and spent the week learning some basic mountaineering skills. We spent the first day climbing South Sister, a 10,358′ tall extinct volcano. I had an amazing time, I learned a lot, and I gained a huge appreciation for big, western mountains. Now don’t get me wrong; I love the mountains here on the east. But the scale out west is on a different level. I’ve dropped some pictures into this post. Bear in mind; these photos were taken in 2004, digital cameras were not as good as they are now, and I was a dorky (no, seriously, very dorky), 135 pound, pimply 17-year-old. Be kind. 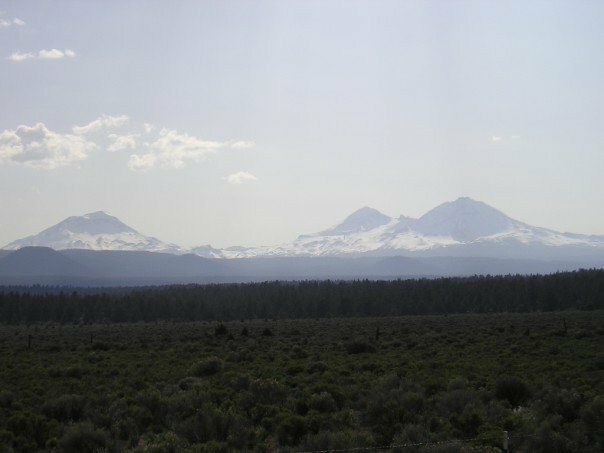 These are the Three Sisters from a nearby highway. I took this photo after we finished climbing. From left to right, South, Middle, and North. A group photo on summit day. That’s me, last in the line, on the right. Summit! I’m down far left, in the maroon fleece jacket and the green/black cap, with the sunglasses. Middle and North Sisters are behind us. Ever since that trip I’ve been fascinated by Oregon. I swore I would make it back out west someday. I actually went through a period last year where I basically spent my evenings ogling northwestern mountains on Google Earth. While looking at the Sister’s range, I saw a possibility. Today, I’ve had a chance to actually consider what it would look like. 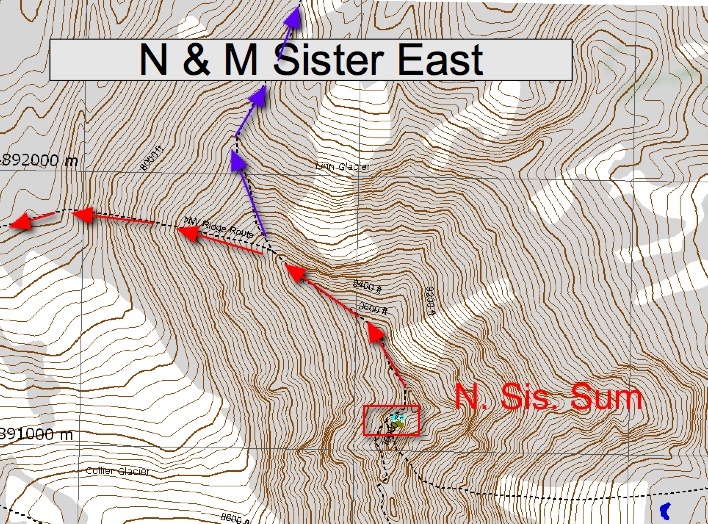 It appears that a traverse of all three Sisters is possible; there is even a pretty logical route. In fact, there is an established trail for most of it. It doesn’t appear to be “hard-core” mountaineering, though knowledge of moving through glaciated terrain would be needed (there are some crevasses in the area). I’m positive it’s been done before, but I haven’t found any reports or documentation of it (granted, I haven’t really looked hard). Still, it would feel pretty epic for me. I’ve found all my resources online. In their own words, the Mazamas “[were] founded in 1894 on the summit of Mt. 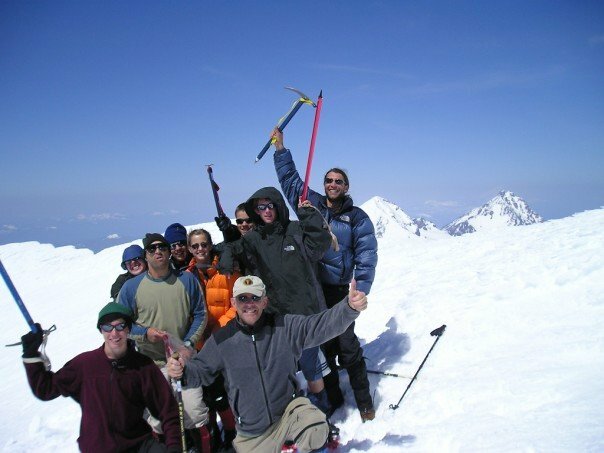 Hood, [and are] a nonprofit mountaineering education organization located in Portland, Oregon. Mazamas offers over 900 hikes and 350 climbs annually for over 13,000 participants.” Their website is invaluable, and includes topo maps of many classic climbs in Oregon, Washington, and California. I’ve been poring over the maps of the Sisters. I’ve also been using good ol’ GoogleMaps and GoogleEarth. So, what follows is “Ethan’s Contemplative Three Sister’s Traverse.” We begin at the beginning. Day 1: We’ll start at the red square. I had to zoom way out so that the entire first bit would be visible, so the resolution is not great (sorry), but the road there is called the Cascade Lakes Highway. The trail begins at the Devil’s Lake Trailhead, right at Devil’s Lake, at an elevation of around 5,600 feet. 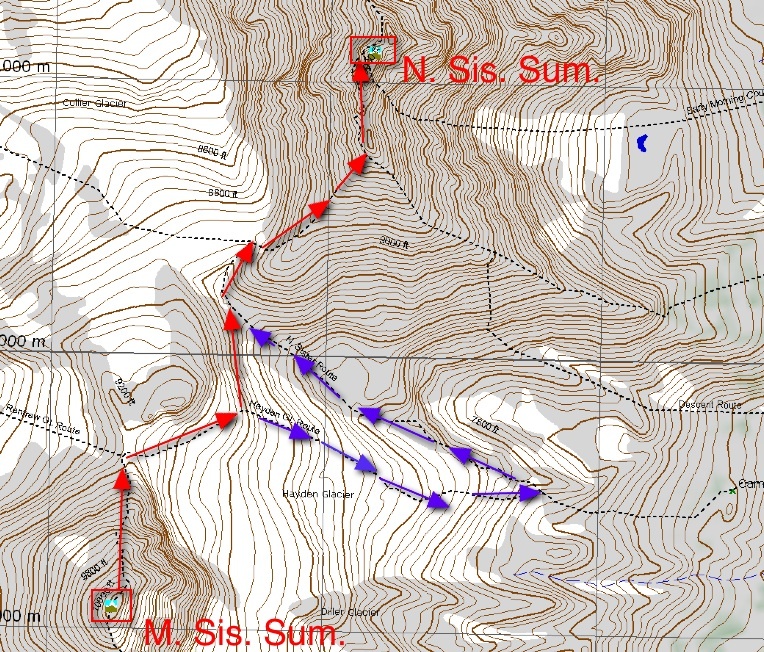 We then climb (my route is the red arrows) up through a ravine, following a stream, to a trail junction at 6,680 feet. That’s an elevation gain of 1,200 feet over around 1.4 miles. Steepish, but not impossible. At the trail junction, we take the right and ascend to 7,120′, camping at the moraine lake (for an early morning start the next day). Day 2, Part 1: Wakey Wakey! Bright and early alpine start! The second day has some serious elevation to tackle. 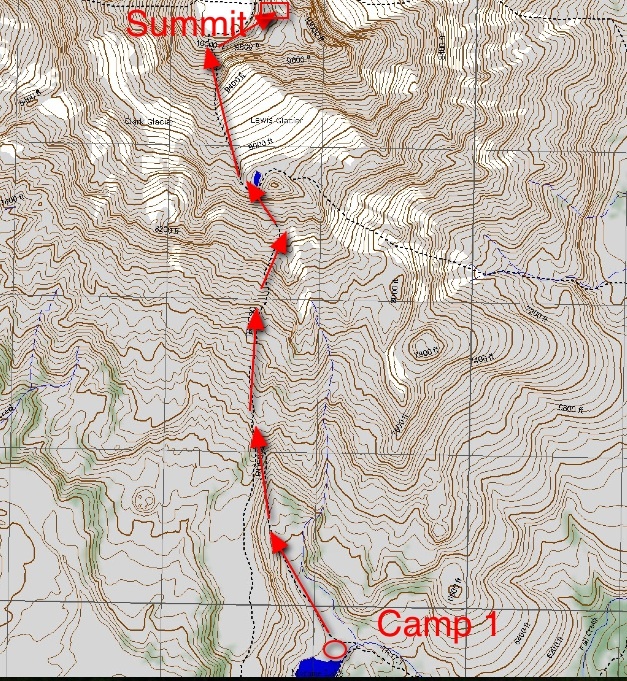 Starting from Camp 1 at 7,120′, we climb steadily 1,320′ up the flank of South Sister to the 8,440′, in a small saddle. We then climb the ridge above the Lewis Glacier onto the summit ridge around the volcanic crater. The summit is at 10,358′. Time to celebrate the first summit! Day 2, Part 2: Enjoy the summit for a bit, then off towards the second summit. Heading north, we follow the North Ridge Route and drop into the gap filled with rolling hills between South and Middle Sisters. 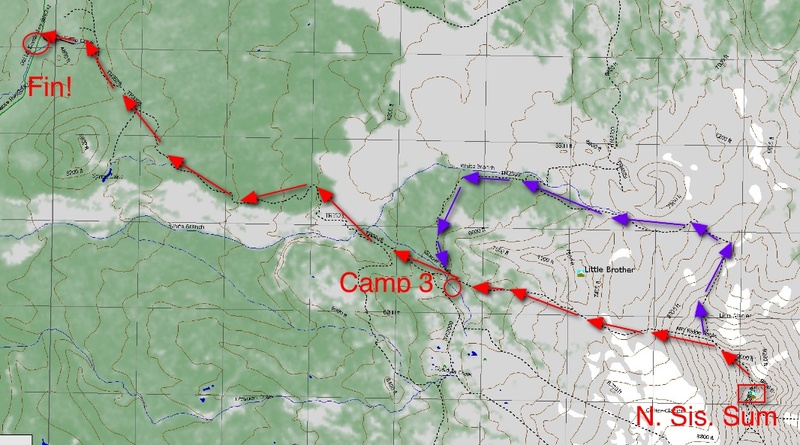 The route loses about 3,000′, coming to a natural camp/rest spot at Camp Lake. 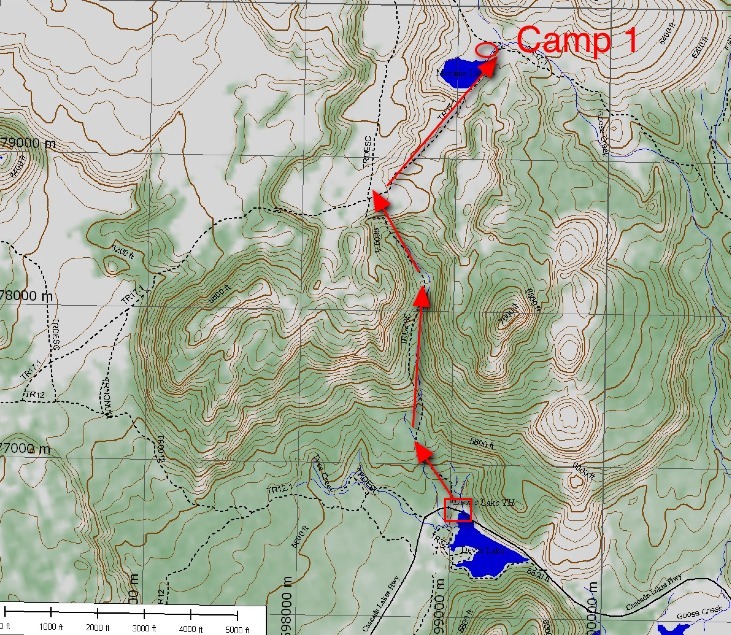 For argument’s sake, we’ll say we aren’t trying to do this in a day, and we’ll make camp for the night at Camp Lake, at around 6,920′ elevation. Day 3, Part 1: Day three will be a loooonnnnggg day. There aren’t too many good spots to camp between Middle and North Sisters, so both can be done in one push. So it’s another alpine start, this time for the summit of Middle Sister. 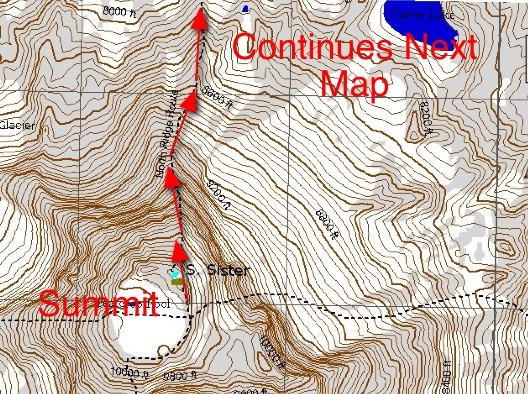 The route ascends 3,000′ to the summit of Middle Sister (at 10,047′) following the Southeast Ridge. Day 3, Part 2: Descend Middle Sister via the North Ridge to the Hayden Glacier, a drop of around 800-1000′. Now, there is a choice to make. We could follow the blue arrows (and the trail), and head east down the Hayden Glacier, only to catch another trail headed back in the other direction (uphill, making up the pretty much 1000′ we lost while following the Hayden Glacier). Have you ever noticed how, if you misspell “trail” it becomes “trial,” as in “trial by fire?” That’s what this option would amount to. 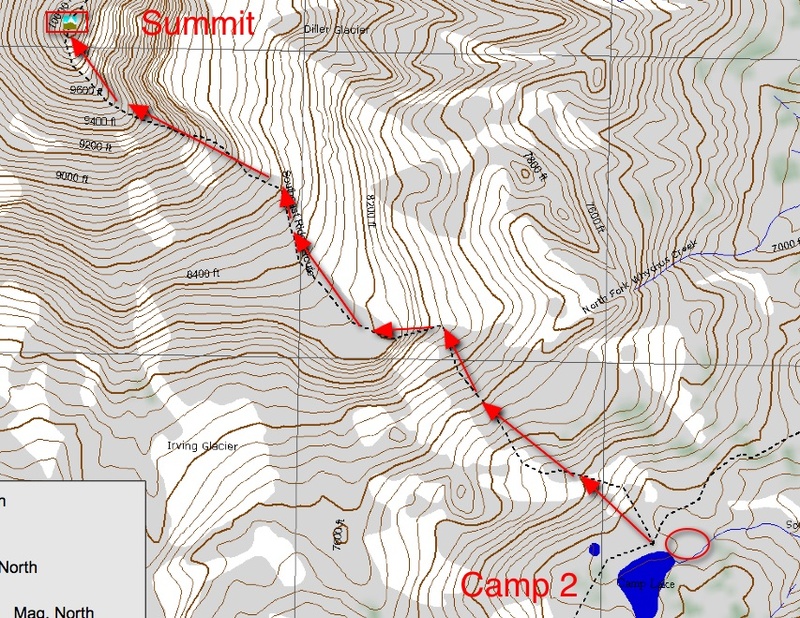 The second (far more appealing) option, in my opinion, is to continue north (following the red arrows) along the source of the glacier, and connecting to the main trail on the other side. Then, it’s 1,000′ up the southwest ridge of North Sister onto the summit ridge, with the summit (at 10,000′) located nearby. Day 3, Part 3: The climb isn’t over until you’re down. We’ll follow the north ridge of North Sister, descending quickly on exhausted legs. About halfway down the ride, we’ll face a choice. 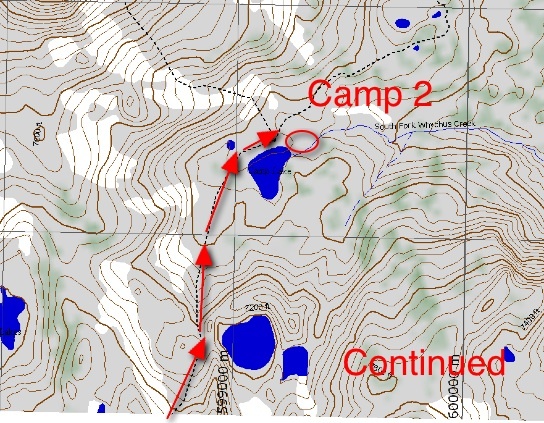 We could continue on the North Ridge proper (blue arrows), which would take us around the north edge of smaller peak called Little Brother. Or, we could follow the Northwest Ridge, which would take us on the south side of Little Brother. Ultimately, it doesn’t matter; both trails converge. Camp 3 would be somewhere below the tree-line. Day 4: Easy, downhill cruise out to Old McKenzie Highway, for the pickup. I should note, it’s possible to make this a loop, but it would take us way down the east side of the maps. I’m not going to attempt to quantify the elevation gain vs. elevation loss. Ending elevation is 4,600′, so net elevation would be a 1,000′ loss. My feeling is that during the summer/”otherwise warm season,” this would be a fairly high elevation, steep, but easy backpacking trip. During the winter, it looks like it would be a moderately technical mountaineering trip. So, who would be interested in this? Anyone wanna go as a partner? Anyone want to pay a large amount for me to guide them on it (kidding…sort of…)? I’m going to try to set up a Google Earth flying tour of the route at some point. Stay tuned for that! 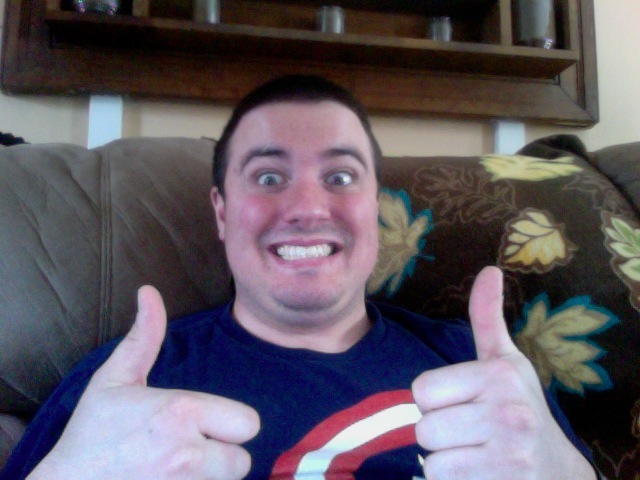 You may have noticed, lately, that most of my posting is done on Mondays. The simple fact is, Monday is one of my day’s off, so I typically spend it at my mother-in-law’s house, taking care of Eli and doing laundry while Melissa is at work. Since there is wifi at the mother-in-law’s, I’m able to update and share what I’ve been thinking about for the past week. I’m getting better at finding opportunities for exercise. Hardly any fast food last week! I stayed below my (shrinking) weekly calorie count! Still need to make exercise a daily thing. This has been tough; the only time I have to go for a walk/run on work days is early morning. It’s been hard to wake up at 5AM lately because Eli isn’t sleeping well (He’s teething). If Eli dosen’t sleep well, I don’t either, and that makes it hard to wake up. Despite finishing under my weekly calorie count, I still went over several times on my daily counts. I need to keep each day under my daily count. I’ve noticed that a lot of my daily intake is from snacking. I need to cut down on snacking, and concentrate on waiting until meal times!